What is the Sichuan Science and Technology Museum? Opened on 2nd November 2006, Sichuan Science and Technology Museum is situated on the north of the Tianfu Square, covering an area of some 6 hectares, including the exhibition space of 2.5 hectares. Through the upgrade in the past year, there are 22 exhibition halls, 2 more halls than before. The upgraded equipment are more scientific and reasonable, highlighting the interactive experience. On the ground floor, there is the Hall of Aeronautics & Astronautics, the Hall of Dujiangyan Irrigation Project and the Children’s Museum. Visitors can explore the Hall of Ecological Home, the Hall of Emergency and Disaster-prevention, and Hall of Healthy Lifestyle on the second floor. Visitors can also interact with robots which will dance well at the Robots Theater, visit the Flying into the Future Theater, 4D Theater, (机器人剧场) and Theater of the Origin of Life(生命起源剧场). In addition, the space station at the museum will offer visitors distinctive experience. If interested, visitors can also cosplay themselves at anime interactive experience area on the third floor. The museum offers a great chance to experience AR and VR. Visitors can also know some about the scientific principles of the Dujiangyan Irrigation System with a history of more than 2,000 years and ride the 360°bicycle, experiencing the adrenaline-rise. Younger children under 6 years old can enjoy themselves at the Children’s Museum. They shall be accompanied by the adults to explore it. They can know the living habits of the animals and the characteristics of the plants there. For those who would like to get acquainted with the traditional Chinese medicine, they can discover some herbs at Baicao Hall. At the Nutrition supermarket, visitors can know the ratio of the composition of one food, such as protein, fat, vitamins, minerals, carbohydrate. It can be visited throughout the year. Sichuan Science and Technology Museum is located at the center of Chengdu. Therefore, there are several options. Take the Airport Shuttle Bus Line 2(机场专线2号线) from Chengdu Shuangliu International Airport to the Stop of the Tianfu Square(天府广场站). Take Metro Line 2 to the Stop of the Tianfu Square from Chengdu East Train Station or Chengdu North Train Station. Go to the EXIT F/B/H. Take Bus 16, 45, 53, 61 and Bus 64 to the East Stop of Tianfu Square (天府广场东站). Opening hours: Tuesday – Sunday: 09:00 – 17:00 for the areas on the ground, the first, and the second floor (16:00 is the last time for getting the admission ticket); Tuesday – Sunday: 09:00 – 20:30 for the Meike New Future College. Notes: The opening hours during the festivals of China are subject to the museum. Please book the admission ticket on the specific page of the museum website: http://ticket.scstm.com/Book/OrderInfo.aspx or through its WeChat official account. One ticket for one person including children. The ticket can only be used once and be valid on the visiting day. Get to the self-service ticket machine in the ticket office for the ticket with your ID card or passport at the appointed time. One adult can only take one child under 1.4 meters to the museum. The child shall be accompanied by one adult. The elders and disables shall be accompanied by one relative to visit the museum. If you can’t visit the museum on the day, please cancel the booking. Tickets can only be booked on the Internet. 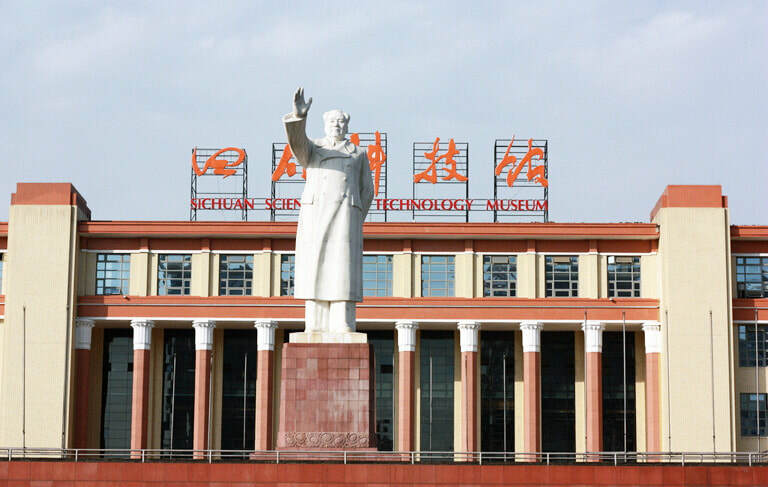 Interested in visiting Sichuan Science and Technology Museum on a Tour? Wendy Wei Tours offers a variety of different packaged tours as well as custom tours including Sichuan Science and Technology Museum, among other attractions and destinations. To find out more, please visit our Tours page or Contact Us directly to find out more.